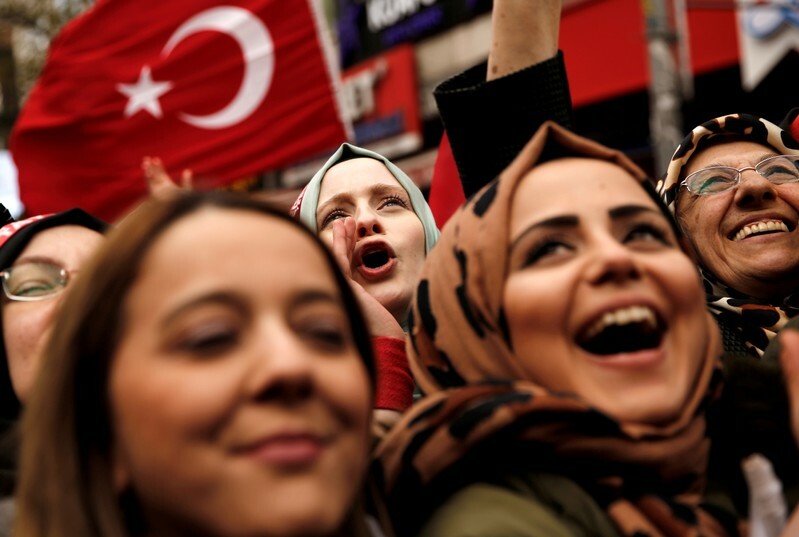 ISTANBUL/ANKARA (Reuters) – It was midnight on election night when Turkey’s main opposition party finally believed it had overturned a decade and a half of failure at the polls and delivered a stinging defeat to the country’s master campaigner, President Tayyip Erdogan. The candidate of the secularist Republican People’s Party (CHP) for mayor of Ankara was comfortably ahead in the capital, but in Istanbul – the biggest prize in Sunday’s local elections – Erdogan’s ruling AK Party candidate had declared victory. CHP politicians and supporters, who had endured more than a dozen election and referendum losses at the hands of Erdogan’s Islamist-rooted AKP since 2002, were well accustomed to crushing disappointment once the ballots were counted. “At around 12 a.m. we realized that we were clearly the winners of the election, that we had won,” said Suleyman Celebi, an aide to CHP Istanbul candidate Ekrem Imamoglu. The party’s own data, he said, showed they had defeated Erdogan’s close ally and former prime minister Binali Yildirim, despite an exhaustive and bitter two-month campaign waged by the president and backed by an overwhelmingly pro-government media. Once they saw the numbers, Imamoglu and his team refused to back down. “We believed after that that there was no turning back, and that we would win,” Celebi told Reuters. That newfound confidence, supported by initial results the next morning showing Imamoglu had narrowly beaten Yildirim, was forged in an opposition campaign that contrasted sharply with Erdogan’s high-profile, confrontational election strategy. The softly-spoken Imamoglu, spurning the kind of mass rallies which Erdogan addressed daily, sought to win over a broad spectrum of voters with a positive message, meeting many of them face-to-face in a campaign which even his opponents acknowledged struck a chord with the electorate. Celebi said Turks, tiring of “divisive and polarizing language” from their leaders, warmed to a new style of politics. “This time we saw an open will to vote for Ekrem Imamoglu across all parts of society,” he said. The CHP made a formal alliance with the breakaway nationalist Iyi (Good) Party and also won votes in Istanbul from supporters of the pro-Kurdish HDP party, which chose not to field a mayoral candidate there to boost Imamoglu’s chances. Confirmation of defeat in Istanbul – a city of 15 million people – and Ankara would not reduce Erdogan’s sweeping presidential powers, but would seriously dent the aura of invincibility he has built up during 16 years of ever-tighter control over the country. His AKP, which has challenged results in both Ankara and Istanbul, still won 51.6 percent of the national vote together with its nationalist MHP alliance partner, down from 53.7 percent in parliamentary elections last year. Three party sources who spoke to Reuters all said there were flaws in a campaign which struck a relentlessly belligerent tone, linking Erdogan’s opponents to terrorists and painting the vote bleakly as a “matter of survival” for Turkey. “Maybe we should have given another message instead of ‘survival’,” said one source at AKP headquarters in Ankara who described it as ill-suited for voters worried about living standards and local services. As early as January, AKP officials were sounding the alarm over falling public support amid high inflation and rising unemployment. Authorities responded to soaring food prices by setting up stalls in Ankara and Istanbul selling subsidized vegetables. That too may have backfired, the same source said, as TV footage of people queueing for food revived images of “old Turkey” and the chronic inflation of the 1990s. “Long lines being formed disrupted the perception of the AK Party,” he said. Another party source said the AKP was still missing former campaign manager Erol Olcok, a close friend of Erdogan who masterminded AKP election victories before he was killed on an Istanbul bridge during a failed military coup in 2016. In recent elections, the AKP could not “find its groove”, he said. For Imamoglu, now preparing to take over Turkey’s largest city and govern 15 million people with a projected expenditure of 24 billion lira ($4.3 billion), the campaign is over but the battle not yet won. The AKP has appealed results of all 39 districts in Istanbul. A party official said on Thursday that once the recount was complete, the AKP’s candidate would emerge on top. Imamoglu says the electoral board “must do its job” and declare him victor but, in keeping with the tone of his campaign, he has stressed consensus over confrontation. Voting starts at 7 a.m. (0400 GMT) and polls close at 5 p.m., with a clear picture of the winners probably emerging around midnight. Defeat in either Ankara or Istanbul would bring to an end a nearly quarter century rule by Erdogan’s AKP or its predecessors in those cities and deal a symbolic blow to Turkey’s leader. The HDP denies links to the outlawed militant Kurdistan Workers’ Party (PKK). He has described the elections as an existential choice for Turkey, blasting his rivals as terrorist supporters aiming to topple Turkey. He has warned that if the opposition candidate wins in Ankara, residents would “pay a price”. “What matter of survival? We’re electing mayors. What does this have anything to do with the country’s survival?” Kemal Kilicdaroglu, head of the CHP, told a rally in Eskisehir. ISTANBUL (Reuters) – Less than a year after Tayyip Erdogan celebrated election triumph with fireworks in Ankara, Turkey’s all-powerful leader faces the embarrassment of losing his capital in local polls marred by bitter campaign rhetoric and economic storm clouds. 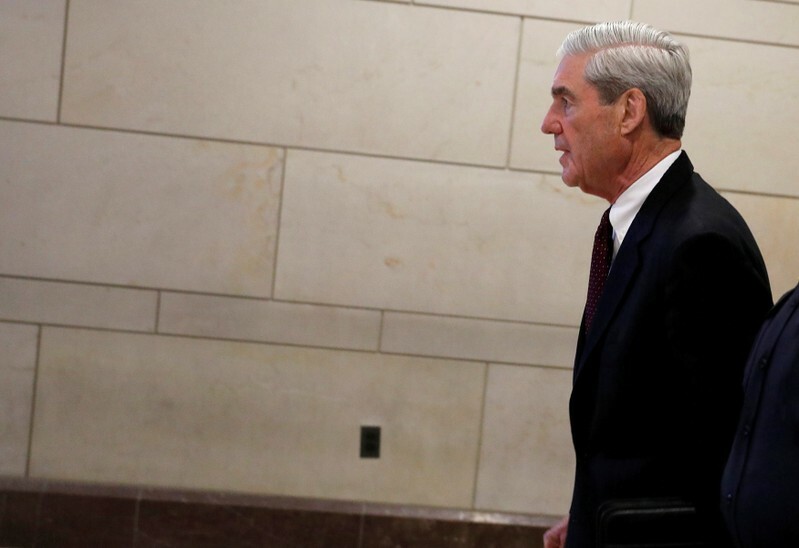 He has toured the country for weeks speaking up to eight times a day – a punishing routine which showcased the supreme campaigning skills that have made him the most popular and powerful leader since modern Turkey’s founder, Mustafa Kemal Ataturk. “A crushing majority of people – including of course voters from the government party and its partners – think the economy is the number one problem in Turkey,” said political analyst Murat Yetkin. Analysts caution against reading too much into polling data – Erdogan won a first-round presidential victory last year, defying many expectations – and even if the AKP were to lose, it would not diminish the president’s official powers. To his passionate supporters, Erdogan is speaking a self-evident truth. 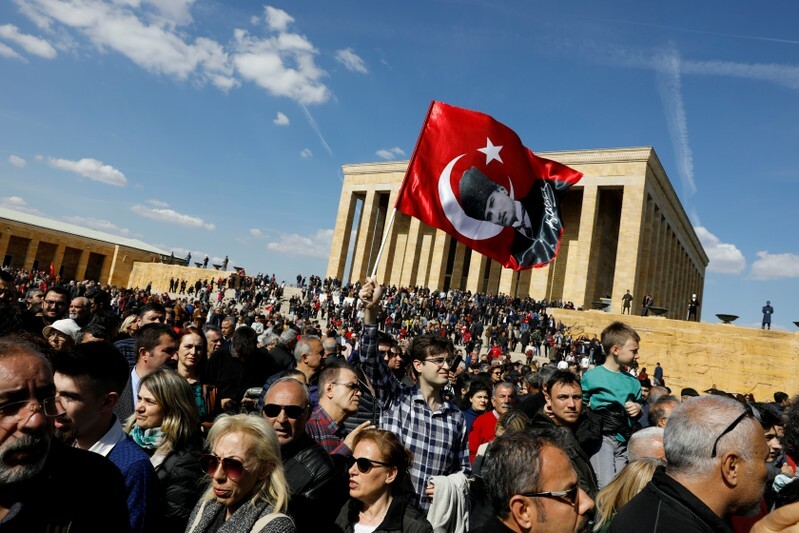 “I see, I hear, and I believe what I see and hear – not just what Reis (the chief) says,” Ismail Zeybek, a 40-year-old electrician, said at the rally. He repeatedly showed extracts from the gunman’s manifesto, which he said threatened Turkey and Erdogan himself, as well as blurred footage from the shooting itself – even after New Zealand’s foreign minister flew to Turkey to ask him to stop. 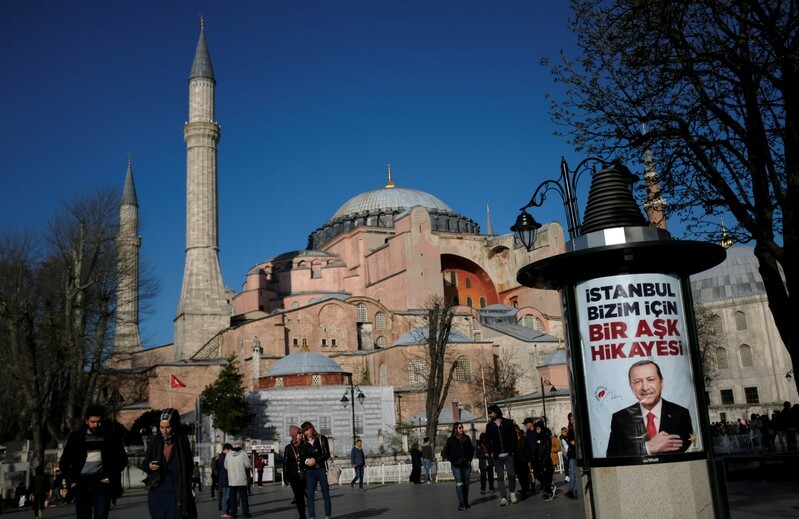 In the final days of campaigning Erdogan also revived calls for Istanbul’s Hagia Sophia museum – the foremost cathedral in Christendom for 900 years and then one of Islam’s greatest mosques for 500 years until 1935 – to become a mosque again.